So yesterday I recieved two Firsts for I am ARG! The first First is my first negative comment! I was honestly expecting it a lot earlier. I rarely block comments and when I do they are just spam comments or call back comments that wordpress oddly makes… The comment in question is here. I left it untouched and will probably leave all coments good or bad unless they’re super offensive or just plain nonsense. 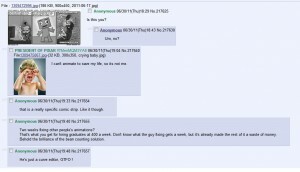 Oddly with all the implied murder, pedophilia, drug use and just bad comicry, religion was the one thing I went to far with. I have a feeling this comic isn’t meant for them. I appreciate the time they did take to read though and if they do come back to read awesome on them. 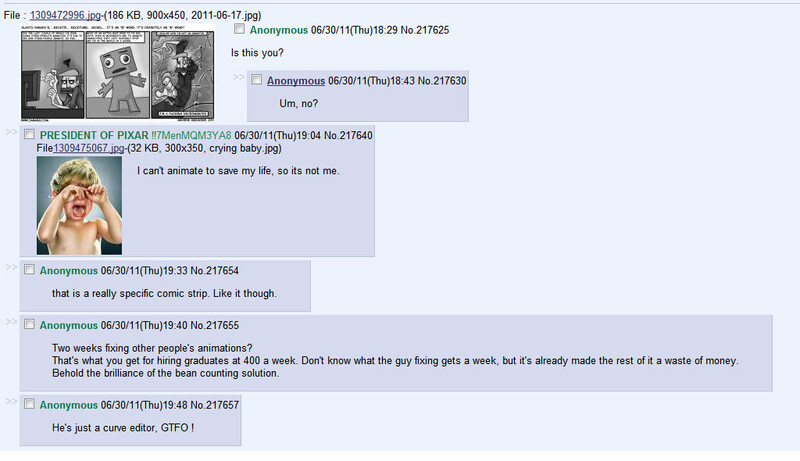 Secondly, I broke my 4chan cherry, my bud David took this screenshot of what I assume is the Comics & Cartoons board on 4chan. Its about the Animation necromancy comic I posted. I feel internet famous now and will be awaiting my massive internet money cheque that inevitably comes with this level of fame. All ego aside I wanna thank everybody leaving comments (good and bad) and for liking the comics on facebook. The word of mouth stuff has helped and I very much appreciate it. Also It’s a new month which means new voting on the vote sites linked on the side. I don’t usually like to pimp the voting but it’s been a nice way to get the comic out to new people. So if you feel like it you can vote for me. Thanks. You didn’t. 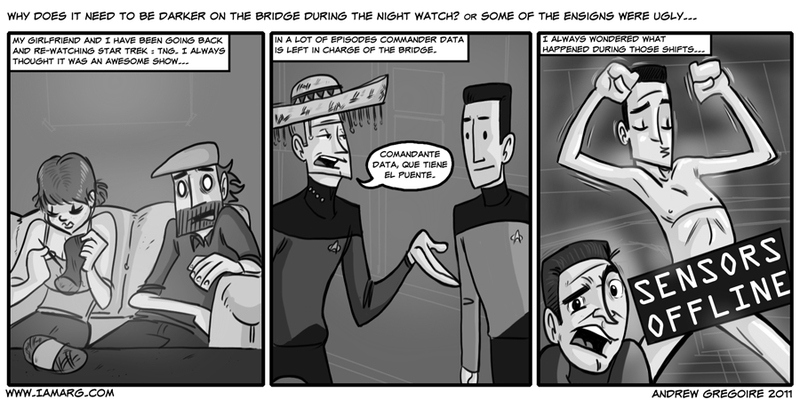 It should be “Comandante Data, tome el mando”. Still, I forgive you, ’cause this comic is pretty awesome. Next time take pictures! Cause now I’m just intrigued by such fashion! Commander Data, you have the bridge. El comandante Data, usted tiene el puente. Commander Data, that has the bridge. Commander Data, is in charge of the bridge. Gahh, Google translate is ok but jebus, never for a second think you can use it to write something correct in a language you don’t even know the basics of. You can use it to have a rough idea of what is being said, or to give you a rough start on how to write a sentence IF you already know a bit of how it all works. But it’ll *rarely* work well enough to pass as correct to people who actually know the language. MikeDB above made the same mistake when he tried to translate Elix’s translation back to English. Google translate missed the fact that there is an implied “usted” before “esta al mando”, making gibberish out of Elix’s perfectly valid translation. And are those the socks the dog dug out of the couch a couple of comics back? I realize this was a few months ago, but crocheting. Because it’s awesome.